Footballers have various ways of dealing with pressure on match day. Some are able to use the increased adrenaline in order to produce higher levels of substances in the brain that enhance performance, like emotional doping. Others succumb to the nerves and often try to hide on the field to avoid making high-profile mistakes. Pressure can manifest itself in other, more visceral ways. In a derby match, when full of adrenaline, some players commit over-zealous fouls and get themselves into trouble. Violence can spoil a good game of football, and this happens so often with fierce rivalries. A perfect example of this was yesterday’s clássico between Grêmio and Internacional in Porto Alegre. The first half was exciting, with some interesting tactical battles and good play from either side. Grêmio took the lead from a penalty kick, before Inter equalised through Leandro Damião. Renato Gaúcho’s Grêmio surprisingly went for a 3-4-1-2 system, bringing in new signing Rhodolfo as a sweeper in the back three. This switch from their usual 4-4-2 was to give more freedom to the wing-backs, who pushed up the field and occupied Internacional’s full-backs, leaving their opponents light and narrow in attack. 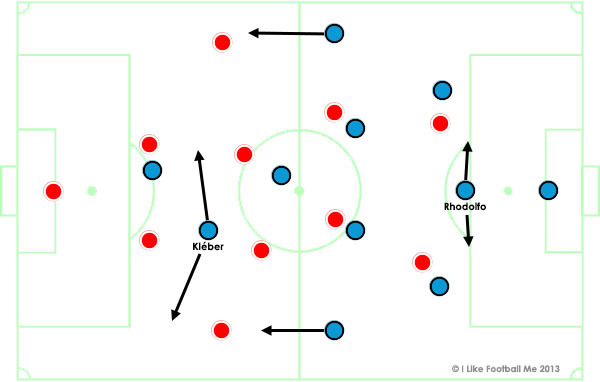 Deep-lying forward Kléber played an important role, drifting wide and creating 2 on 1 situations on either flank. With pressure levels turned up to eleven, the second half turned scrappy and play was repeatedly stopped for violent fouls. The referee lost control of the players and red cards soon followed. We were robbed of a suitable ending to what began as an intriguing match. Some people relish this type of game. However while violence is clearly a source of entertainment for many (you just need to look at the popularity of sports like mixed martial arts and boxing), football doesn’t need it. Clássicos aren’t all bad, though. Sometimes they get it right. Vasco x Botafogo was a good example of why derby matches can be so enthralling. Spurred on by the pressure, both teams played with higher intensity while staying within the rules. As a result, we were treated to some excellent Sunday evening entertainment. Botafogo is currently the best team in the Brasileirão. Head coach Oswaldo de Oliveira has built a wonderful 4-2-3-1 system that revolves around veteran midfielder Clarence Seedorf. They work extremely well as a unit, pressing high and with superb movement in attack. Seedorf got on the score sheet once again, his 18th goal in 29 appearances for Botafogo. Before moving to Brazil, Seedorf had scored less than 100 goals in a club career that comprised over 700 appearances. This sudden surge of goal scoring form has nothing to do with a gap in quality between the Brazilian league and any of Europe’s finest, it comes as a result of Botafogo’s playing style, which has the Dutchman at the centre of everything. With Botafogo leading 2-1 at half-time, Oswaldo de Oliveira had a decision to make. Last weekend, leading at the break in another clássico against Flamengo, Oswaldo changed his team’s approach for the second half, bringing off attacking midfielder Vitinho and replacing him with defensive midfielder Renato in an attempt to “administer the game”. All that did was remove Botafogo’s only deep threat and invite Flamengo to attack. Botafogo conceded a late equaliser, and Oswaldo was a victim of the clássico pressure. Though Brazilian coaches and commentators love to use the phrase, it is extremely difficult to administer a football match. There are so many factors to administer in a game, and attempting to do so is futile and often counter-productive. Excellent coaches learn from their mistakes, and Oswaldo did just that. Yesterday, instead of trying to administer the game, Oswaldo kept Botafogo in their usual system, which is strong enough to beat any team in Brazil at the moment. They went on to win 3-2, and are deservedly at the top of the league. It’s back! That’s right, Game of the Week has returned for 2012 to bring you plenty of in-depth analysis of some of South America’s biggest matches each week. An early warning is in order however, as during the first half of the year this section will be very Copa Libertadores-heavy. Focussing on this wonderful tournament gives you all a chance to have a look at a variety of the continent’s best clubs and observe the fascinating tactical battles between them. Apologies for the delay in this particular Game of the (last) Week, but from now on I will be striving to post these up on the day after the match (usually Wednesday/Thursday/Friday). The Copa Sul-Americana (or Sudamericana in the Spanish-speaking majority of South America) is a rather odd tournament. It is highly under-valued all over the continent, but particularly in Brazil, where the midweek games at key points in the tournaments are seen as little more than unwelcome distractions. For example this year, when São Paulo, Botafogo and Flamengo were eliminated in the space of 24 hours at the last-16 stage, there was some immediate surprise, but it was very quickly forgotten. Think of it as the South American version of the Europa League, but with considerably longer travel times. The tournament got a little boost in the past few years after CONMEBOL decided to award an extremely valuable place to the following year’s Copa Libertadores group stage. As a result, a number of the continent’s ‘lesser’ sides shifted their focus towards the Copa Sul-Americana and away from their own tough domestic campaign, in search of an ‘easy’ route into the Copa Libertadores. Just a little reminder that my most recent post on the Mirror Football website was published today, a little look at the crazily competitive season we have had in the Brasileirão, with a mind-blowing stat to back it up. You can find the post here, have a read, and if you have any opinions or anything you’d like to discuss, drop me a comment on the site, or here at the end of this post. I’ll be back in mid-week (probably Thursday, Wednesday is a national holiday) with the Game of the Week from this weekend, and I will also have another Twenty to Watch profile going up. Stay tuned.